Spinal Problems: including prolapsed discs, degeneration, lumbago, sciatica, stiff/painful neck, pain referring to arms or legs. Joint Problems: injuries, arthritis, pain/swelling/stiffness in joints such as shoulders, elbows, wrists, knees, hips and ankles. Injuries: to muscles, joints, ligaments, cartilage, tendons or bones. Work related conditions such as Repetitive Strain Injury (RSI). Work Related Problems: eg. overuse injuries, postural problems, back or shoulder problems. Fractures: treatment to increase the healing rate and to gain full function once the bones have healed. Rehabilitation After Surgery: rehabilitation after orthopaedic surgery, e.g. hip and knee replacement or general physiotherapy after general surgery. Regaining muscle strength, mobility, fitness and balance. Headaches and Facial Pains: tension headaches, migraine, trigeminal neuralgia. Chest Conditions: both medical and surgical, including hayfever, asthma and sinusitis, pnemonia, cystic fibrosis, emphysema, bronchitis and bronchiectasis. Paediatrics: for childhood conditions including postural and walking problems. Facial and Other Palsies: e.g. Bell's Palsy, dropped foot, muscle weakness. Neurostimulator for home use available. Pain Syndromes: eg. 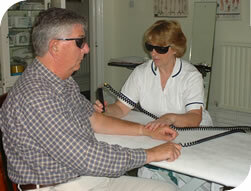 Reflex Sympathetic Dystrophy, chronic or recurrent pain, nerve damage pain, abdominal pain. Sports Injuries and Rehabilitation: Soft tissue and joint related sports injuries from any sport. Treatments from the initial acute stage, through to returning to fitness. Circulatory Problems: wounds, ulcers using laser therapy. Physiotherapy: a wide range of modalities are available, including exercise therapy, manipulation, mobilisation and electrotherapy. 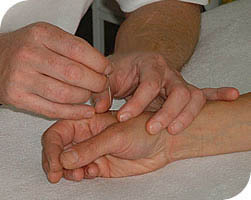 Chinese and Western Style Acupuncture: May be used on its own or in conjunction with Physiotherapy. Reflexology: Gentle massage of reflex zones on the feet, to relieve tension and encourage healing. Aromatherapy: Massage with pure plant oils to promote health and wellbeing.